Exhibition 2018 – Sugar vs the Reef ? Wollongong artists Kim Williams and Lucas Ihlein have been visiting the Mackay region since 2014 to gain a deeper understanding of the sugarcane industry and to investigate how artists and farmers can work together on large-scale human/ecology problems. 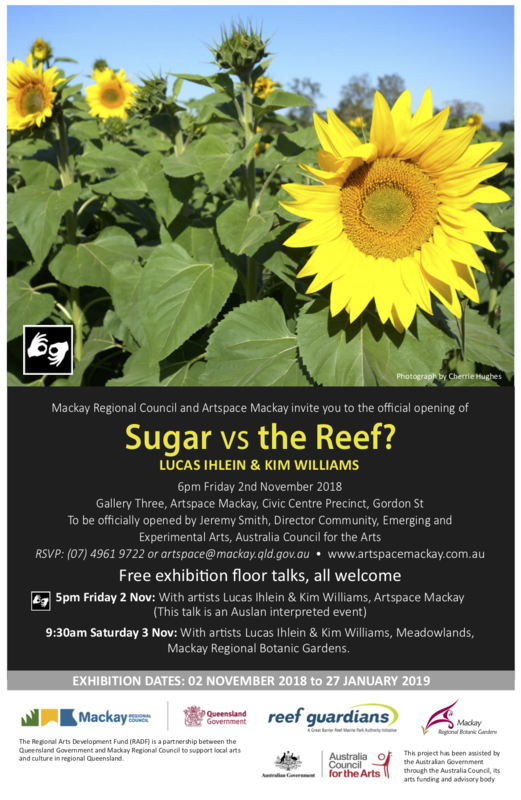 The declining health of the Great Barrier Reef has increased pressure on the sugarcane industry to reduce chemical and sediment run-off and improve its environmental performance and it is this challenge that lies at the heart of their Artspace Mackay exhibition Sugar vs the Reef? The social and ecological engagement that has occurred over the life of the project, through the artists’ interactions with local farmers, the Mackay Australian South Sea Islander community, Yuibera descendants and Traditional Custodians, politicians and Natural Resource managers, has informed the stories told through this exhibition. It is also important to acknowledge that Sugar vs the Reef? forms part of a much larger body of work, which has seen Kim and Lucas create large-scale events and installations in the region, including the Sunset Symphony in the Sunflowers event on the Mattsson’s farm in 2017 and the ongoing Watershed Land Art Project at the Mackay Regional Botanic Gardens. The artists’ passion for working with communities and their desire to develop ethical relationships between humans and land through their collaborative processes are truly inspiring. Sugar vs the Reef? is a fascinating look at what’s possible when artists and farmers come together to envision a new future for agriculture.